The theme of our fundraising dinner is to embrace the spirit of “Empowering Our Disadvantaged Singaporeans through Employment”. We have prepared a special programme aimed at celebrating diversity through food, song and entertainment. Better yet, all proceeds will be donated to Bizlink Centre Singapore Ltd – Philanthropic Workfare Fund to fund their operation and needs of its beneficiaries. It aims to keep the needy socially disadvantaged including persons with disabilities in employment through our sheltered employment and 7 social enterprises. 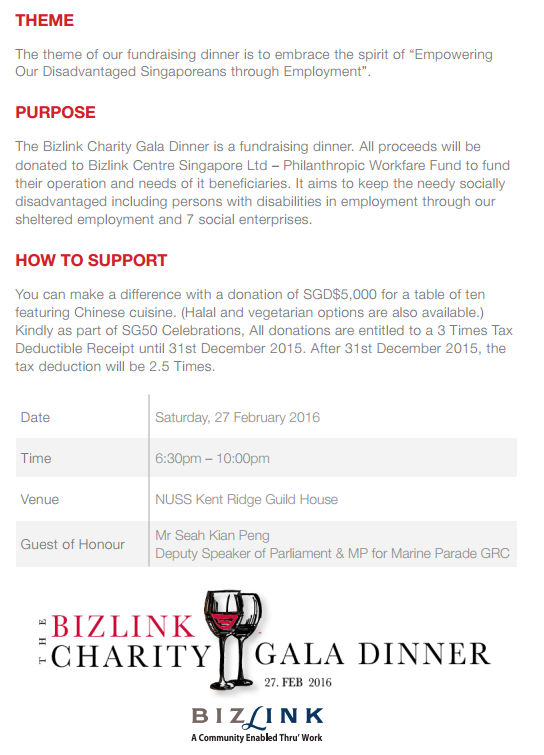 For more information about the event and to make a difference, please email jaykim@bizlink.org.sg. Download the Response Form now!